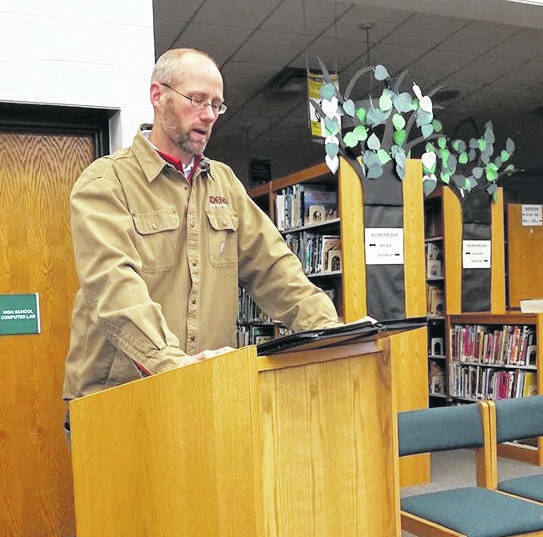 CLEAR FORK VALLEY — With the end of 2018 nearing, Clear Fork Valley Local Schools pfficials are starting to think about important items, like how to move the volumes of materials from two old elementary schools into their new digs. A plan to accomplish that task — scheduled to take place during a three-week break at Christmas — involves using skills and packaging supplied by a local moving company, Dearman Moving and Storage of Mansfield. The school board at Monday’s meeting approved spending $24,500 to hire the company and purchase totes, which teachers will use to pack items in classrooms. School board treasurer Bradd Stevens said he had worked closely with Chris Campbell of Dearman, and after he visited the schools three times, they came up with a computation which says 1.5 cubic feet of materials can be held in the totes, and it will take 4,000 totes to do the job. The totes will be delivered to the schools in Butler and Bellville before Christmas break, so teachers can start their packing work. The totes the board will be purchasing are made by MER Systems. Campbell showed the board how the materials work. The gray totes can be packed, lids closed, then stacked on a rolling base, which makes transporting easier, he said. Stevens said the system is fluid, in that a teacher needing more space can barter with a cohort to make a trade. If a person needs more totes, that’s fine, he said, because someone else may need fewer containers. The system will be set up so labels can be put on each tote, specifying where the carriers should be placed in the schools when delivered. He said he has room for the totes in his barn. Campbell reminded him it would be 4,000 units. Stevens said the system will allow 40 totes per room in the schools. “Teacher A can negotiate with teacher B on the number used,” said Stevens. Construction at the schools is progressing, Brad Geissman of Adena Construction, told the board. He recited a list of numerous advances in the projects. Geissman said roofing and siding has been completed at Butler and is almost done in Bellville. Wood for gym floors has been delivered to both locations, and will be installed this month. He said the grass is “out of control” in Butler, but “loose furnishings” — tables, desks and other items — have been picked out. Mechanical units are partially up and running, Geissman said. At the Bellville school, there will be an elevator and that will be installed soon. The board has not scheduled a time when it will review the proposed termination of principal Kirsten DeVito, who had served at Bellville Elementary School. Superintendent Janice Wyckoff said DeVito has asked for a hearing. That process means a decision on that matter must be delayed. She was suspended without pay Sept. 20. Allegations brought against her included using signatures of teachers without their permission. Part of the duties of a principal include reporting on teachers’ performances. An open house at the Butler building has been scheduled for Jan. 4 from noon to 3 p.m.